In the outcast city of Kaer Maga, your business is your own, and no ware is too dangerous or taboo to find a buyer. Within the walls of the ancient, ruined fortress, refugees and criminals from every nation disappear into the swirling crowds of gangs and monsters. Here leech-covered bloatmages haggle with religious zealots who sew their own lips shut, while naga crime lords squeeze self-mutilating troll prophets for protection money. And these are just the city's anarchic residents, not the fearsome beasts barely contained in the mysterious dungeons beneath the streets, held at bay by the elite rangers known as the Duskwardens. 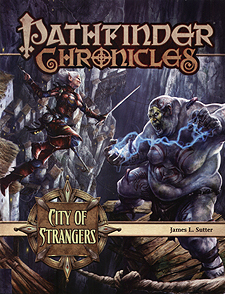 Welcome to the City of Strangers, a haven of freedom and independence - assuming you survive. Detailed gazetteers for all 11 of the city's districts, from the fabled Balconies of Bis to the necromantic paradise of Ankar-Te. The bloatmage prestige class, in which spellcasters use their own blood to empower their spells - but at a terrible price.